Part of Calder Abby, Cumberland. 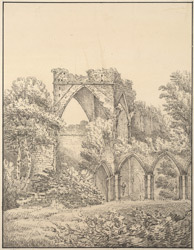 bl.uk > Online Gallery Home	> Online exhibitions	> King George III Topographical Collection	> Part of Calder Abby, Cumberland. Calder Abbey was founded in 1134 by Ranulph de Meschines for an order of Cistercian monks. It was situated on the northern banks of the Caulder River in a secluded valley surrounded by trees. This remote location would have been ideal for the monks who lived lives of contemplation and prayer. The Abbey was dissolved during the reformation of the 16th century and the buildings fell to ruin. The Abbey church was originally built in the traditional shape of a cross with north and south transepts and a tower, the remains of which can be seen in this sketch.